tapir: As far as I can see all earlier examples on the page fit Robert's definition as well. No deshi would have called any of the counterexamples solid connections but "silly move", "dead in gote", "connect and die". Where actual use may be different - and these are the interesting cases - is probably sth. like answering a peep against a hanging connection (what is the japanese practice there?). RobertJasiek: The first three stupid diagram examples drop out using my definition because of the condition "the opponent cannot capture". 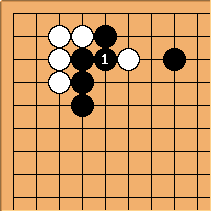 When the opponent (here: White) can capture, then it is not a solid connection according to my definition. The fourth stupid example drops out because of the condition "not in atari". Here it is atari, so it is not a solid connection according to my definition. Bass: Diagrams 2, 3 and 4 don't seem to require a specific term. 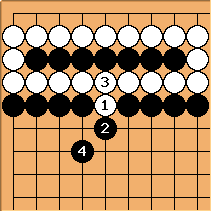 Figure 4 is the only one even remotely worth interest for a go player, and for that purpose "connecting" is quite descriptive enough. Less jargon makes for more understandable language, so defining terms just for the sake of having more terms is counterproductive. Redefining, doubly so. A case that I probably would have called solid connection is when connecting against a peep to a hanging connection, which you wouldn't call like that. And it seems in the string connection discussion that you have some good reason for that. So please, let us discuss the interesting examples. Robert's comment from String connection forum: "White 1 in your example is a "thick string connection". It is also a thick cut protection. It is not listed as a subtype of thick cut protection because it is already listed as a subtype of thick connection. All subtypes of thick cut protection might also be listed as subtypes of thick connection. Not vice versa though: thick diagonal connection or thick jump would not fit under thick cut protection. The feature you are wishing to have ("preventing the cut") White 1 does have also under my terminology because it also qualifies as a thick cut protection. Now let us study White 1 and solid connection. Three more conditions of solid connection (string-connects, blocks opposing strings, strings are not in atari) apply. The not applying fourth condition is "exactly two strings". Only one condition is violated, so it is almost like a solid connection but not exactly what I have defined to be a solid connection. I wanted to exclude the answer to a peep against three strings and the string connection of four strings. 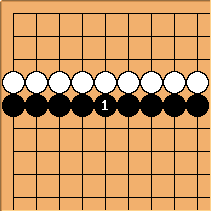 I excluded them because they are not the usual wall-like solid connections but they have some greater degree of inefficiency: In your example, the left white stone contributes little to the rightwards wall formation. In a connection of four strings (not in atari) example, a string connection creates overconcentration rather than increasing solidity significantly. Solid connections should be associated with efficiency. Thick string connections can be, but need not be that efficient." RobertJasiek: Bass, deciding what we want for Dia. 1 to 4 is one thing. Another is to check which definition applies to these diagrams. And there I notice that SL's current definition applies while we do not want it to apply there. Hence the definition must be changed to agree to what we want and how we like to use the term. - tapir, if the definition is to be applied in a certain context only, then that definition has to be enhanced to admit and state that context! In other words, the current SL definition has to get some more specific conditions. - tapir, the more interesting examples are another point of discussion; worthwhile but not solving the more stupid / trivial points of discussion. Tapir: Yes, please let us discuss those examples where the difference is interesting. (It is always difficult to explicate implicit assumptions, you need so many words and I may end with a similar definition like you :D Seriously I believe the term solid connection was meant as a solid way to connect against a meaningful cut from start on.) As I am half convinced already that a more limited meaning for solid connection can be helpful, please let us discuss the interesting examples, I guess after all the difference in application boils down to you limiting solid connection to the connection of only 2 chains, while as someone who learned from SL I would have used it for 3 chains (as in the peep example) too. Bill: Linguistic point: It is not necessary to specify aspects of usage that follow from pragmatics. For instance, if a stone or string is in atari, it is not necessary to specify that a connection is solid, because the only kind of connection possible is a solid connection. Therefore, the term chosen will usually be the simple "connection". That does not mean that the connection in this case is not a solid connection. RobertJasiek: Atari does make a difference. In the non-atari case, (probably) White can cut because he does not need to spend another play on reinforcing. 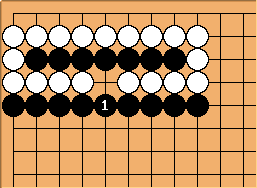 In the atari example case, (probably) White cannot cut because he is busy reinforcing. Bill: Robert, I defend to the death your right to define your own terms. 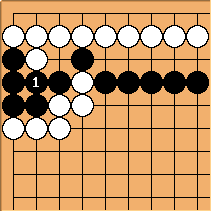 But neither your, nor I, nor John F., nor anyone else is the arbiter of English go terms. That said, there is value in keeping definitions simple, and letting pragmatics take care of niceties. Usage notes are also valuable. RobertJasiek: There are limits to that when careless pragmatics desinform more than inform. One must fight against bad descriptions so that they do not spread and hurt better usage. RobertJasiek: These two examples show that there can be good reasons to consider my book definition of solid connection a bit too strict. Besides there appears to be scope of variation for possibly good definitions: Either one uses "the opponent could cut immediately" as a criterion or not. Including it emphasises both players' follow-up moves while not including it emphasises only the defender's connecting follow-up move. Bill: If someone called this a peep, I would agree. If they called it a solid connection, I would not object, even though White can only threaten to cut. connect bamboo joint is thick? Andy: I have trouble with describing these connections universally as 'thick'. This connect seems to fit the RJ definition, but I wouldn't call it thick. Hyperpapeterie: Robert's definition includes the condition that the stones can't be captured. Doesn't that make the definition hard to apply? From a few examples I have seen, I would assume that what is meant is something like "cannot be [easily/immediately/locally] captured", but this seems contrary to his practice of explicit definition. RobertJasiek: The example is a thick string connection but not a thick cut protection and therefore not a solid connection according to my definition. 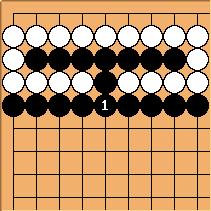 It is not a thick cut protection because it does not protect against an opposing cut because the opponent cannot cut if Black 1 is not played. Can everybody please apply my definition's conditions before suggesting that an example would violate them? It is becoming boring to explain how to apply a definition: by applying its criteria! By applying them - not by not applying them. 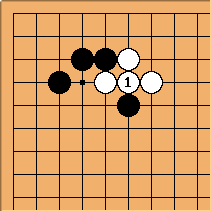 Black 1 is a thick shape move because the criteria of thick shape move apply: It leaves behind little or no aji (yes! ), the opponent cannot capture (yes! ), the opponent cannot cut (yes! 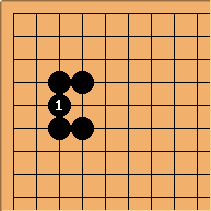 ), the opponent cannot play painful forcing moves against it (yes!). As you can see, "the opponent cannot cut" and "the player protects against a [possible] cut [by the opponent]" are different criteria. The former is a criterion of thick shape - the latter is a criterion of thick cut protection. If the opponent already cannot cut, then there is no cut [option] the player can protect against; the player does not have the option or requirement to protect against some threat / attacking option / cutting option that is not even there. Andy: Well and good, but my objection is to using the term 'thick' in this context. Connecting the bamboo joint is a string connection, but I wouldn't call it either a thick connection or a thick shape. RobertJasiek: It meets the criteria of thick shape. So why would you not call it thick shape? Note that thick shape does neither equal nor require "outside influence", quite like thickness does not need to be on the outside! Andy: Because it perverts the useful meaning of 'thick'. 'Thick' is good, but an excess of thick is 'heavy', which is bad. 'Thick' loses much of its usefulness as an instructional go term if shapes like solidly connecting the bamboo joint are called thick. The goal of language is effective communication of useful or interesting concepts and this definition of 'thick' goes the wrong direction from that. RobertJasiek: Thick is good in some respects but thick does not mean good in all respects. In particular, there can be efficient thick shape but there can also be inefficient thick shape. RobertJasiek: Time is ripe for finding out that terms are (still) used with different meanings by different players:) Example: Thickness surrounding and protecting territory during the late game consists of thick shape but also can often (or very often?) have inefficient shape parts. Andy: So much is obvious from your incorrect usage of the term. Again, is there an example from the literature (other than your own) where play or shape is described as 'thick' in a pejorative sense? Andy: So, you called the move solidly connecting a bamboo joint a "thick shape move"... do you think solidly connecting a bamboo joint belongs on the Thick Play Examples page? Where is the real difference? Tapir: Apart from the old discussion between pragmatist and definitionist approach to language... It is sad, that we spend our time on outright ridiculous made-up examples, which would not be called "solid connection" by neither side (most are simply connections without attribute, utterly useless ones on top of it), instead I would like to discuss those, where it matters. My understanding of the difference: Robert's term limits solid connection to connecting exactly two chains, which excludes connections against a peep to a hanging connection or the example from the string connection page. This limitation would allow to see the "solid" in "solid connection" as more than a specification of the way it is connected but as a property of the connected stone which form an efficient, thick (in whatever meaning) shape as opposed to that the general definition allows to connect solidly but ending with empty triangles. Thinking about efficiency while connecting may be helpful to many players. What do you say? It is a thick string connection. It depends on how solid connection is perceived whether it is also a solid connection. With or without "protecting against an opposing cut" being a necessary criterion. 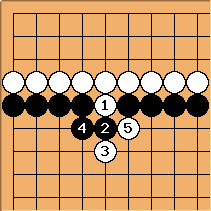 Of course, if one replaces a move that is a cut by the more general concept of n-connection and rewrites my definition of thick cut protection accordingly, then we can observe that, before any move here, the two outer black strings have a 1-connection (but not a 2-connection). 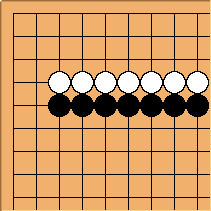 So Black's defense here protects against a 2-cut (White can cut by making two successive plays) and creates a *-connection (White can never cut). Tapir: Please note: There is nobody present, who called your counterexamples 1-4 solid connections. 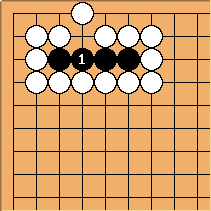 1-2 are outright silly, 3 is a connect-and-die, 4 is a connection with no need for specification. Much of the trouble stems from your insistence to use general terms only, which makes it necessary to explicate all limitations in use in the written definition, which isn't necessary with a more pragmatic approach. Pointing this out isn't yet another definition, but an attempt to explicate the implicit "application rules" to the more definitionist reader. So, on this page (like on others before) we have a discussion about the correct approach to definitions, but we miss the opportunity to discuss the real pragmatic difference, in which I would be interested, which is a pity. RobertJasiek: If you want a pragmatic approach, then, on the parent page, we can have both a heading Definition and another heading Pragmatic Approach. Please make suggestions for the contents of the latter section! Apart from that, I want to see a better definition or a multiple choice of better definitions in the Definition section. I do not ever insist on using general terms only - I insist on having general terms for general meaning and specialising terms for specializing meaning. I also insist that terms I consider specialising are NOT described with a too general meaning. Written definitions must always be careful and precise because that is their purpose. The existence of a pragmatic approach description does not replace the need for a definition approach. Bass: I insist that you stop insisting such harmful things. If you absolutely cannot write a scientific paper without having two terms that differentiate between "solid connection" and "non-idiotical solid connection where stones weren't in atari and groups were fewer than three", then you define those terms in that paper. No-one ever will be able to read any text where those two terms are used without explicit definitions, so any attempt to define them beforehand is useless and adds complexity and confusion where there is no need for any. Granted, your approach might conceivably be useful when doing pure mathematics. The topic here, however, is purely a linguistic one, and different methods need to be applied. RobertJasiek: If, as you say, the topic here is a purely linguistic one, then why do you speak about scientific paper and pure mathematics (something nobody has suggested here)? If the topic here were purely linguistic, then great differences of contents suggested for the term would not have arisen. We can discuss linguistics later. Now it is time to discuss contents of the term first. I suggest that if tapir wants a pragmatic approach, then we can have both a section for pragmatic approach and another section for definition. This is not harmful but it is useful because it informs the reader well. I suggest that tapir makes suggestions for a pragmatic approach. This is not harmful but it is useful because it is tapir who wants a pragmatic approach and therefore can be expected to have an idea what it shall be about. I want to see a better definition. Is any better definition ever harmful? Alternatively I suggest a multiple choice of better definitions. This is a wiki and as such there to inform readers well. Reality is that different definitions are floating around or used. Describing reality informs the readers well. This is not harmful but it is useful because it meets the intention of this wiki. I insist on having general terms for general meaning and specialising terms for specializing meaning. This is not harmful but it is useful because it creates an identity between terms and their meanings. With "I also insist that terms I consider specialising are not described with a too general meaning. ", I point out that tapir's description of my intention was wrong. Clarifying my (or any) intention is not harmful but useful on a wiki. Harmful is only your indifferent use of that word. Instead you should discuss about contents rather than provoke meta-discussion. Bass: You ask, "Is any better definition ever harmful?". Absolutely. If you define "better" as "rigidly defined, never mind the needless complexity, understandability, ease of use, potential for errors, tradition, or conflict with current practice", then "better" can be very harmful. Your other bullets I pointedly ignore. RobertJasiek: There is no need for meta-discussing "better". There is need though for terms expressing what we want them to express, at least roughly. Terms that fail in by far over 50% to meet our intention are a failure in their definition. - Is there still any support for Charles Matthews' definition variant of equalling solid connection with string connection? Or do we now all agree that making thick shape is a requirement for solid connection? It would be good to know because then we have a simplified discussion. RobertJasiek: If indeed the intention was not string connection (but a few days ago some discussion sounded like that), then any text must make that clear! All examples are valid. There are no bogus examples. Maybe you don't like counter-examples, but why then don't you simply agree to adding "thick shape" to the definition? Your hints to implicit and context say nothing while "thick shape" would say a lot. I thought you were first asking for others' opinion on the thick shape examples but apparently you want more opinion from me. Ok. 1) The minimal requirement is thick string connection. Otherwise your claim that you don't want to discuss the counter-examples so much does not make sense. So now I presume that we agree on at least thick string connection as a criterion. 2) Hanging connection is different simply because it is not a string connection. Also empty net and thick throw-in are different. Whatever we define for solid connection, these differences must remain clear. I do not think that we are in danger of violating the differences because between (1) and the likely strictest definition, which is my mentioned current book definition of solid connection, the definition variety room does not cause a problem. 3) There is a difference between ordinary thick string connection and solid connection as I perceive it and as everywhere (incl. here) the typical examples of solid connections show. So I think equating the two or confusing their names is insufficiently serious. It is worth defining solid connection as something more particular. 4) Protecting against cutting potential, efficiency, atari and number of connected strings (maybe yet more aspects) all play a role for a difference between thick string connection and a more particular solid connection. The exact characterisation in general is not obvious. In other words, there appears to be scope for variation in the just mentioned definition criteria. Depending on which aspects one wants to emphasise, the definition will be a bit different. And maybe it is the entire definition room beyond thick string connection to my book definition that defines what a solid connection (in its sense of being more particular or more "solid" than the ordinary thick string connection) should be. RJ: Terms that fail in by far over 50% to meet our intention are a failure in their definition. Bass: Oh please. Was Robert Jasiek a "Robert Jasiek" after he was born but before he was given a name? Is a dead "Robert Jasiek" still a "Robert Jasiek"? When I claim "Robert Jasiek might say something stupid", should I instead use some other term that excludes a sleeping or diving Robert Jasiek? Does "Robert Jasiek" uniquely define the amateur go player of the turn of the millennium, or is it possible for others to be called "Robert Jasiek" too? RobertJasiek: Attacking meta-discussion about users or personal attacks like yours ("Robert Jasiek is a failure in his definition by his definition. "), which could be written without any sound of personal attack as "Robert Jasiek fails in his definition by his definition. ", are out of place in a friendly wiki. Bass: My apologies for using your words in a way that is exact and accurate, but you can interpret as an attack. So would you say that "Robert Jasiek" is not a term, or that you can provide an example of a term for which it is impossible (or at least difficult) to invent enough inaccuracies to fulfill your 50% failure criterion? Dismissing the entire point because you managed to find an excuse for indignation does not seem exactly fair. RobertJasiek: Concerning the 50% requirement, it is my offer of compromise. I prefer to strive for 100% and else approach 100% as closely as possible. When not everybody wants to be that precise, there should still be minimal standards for a description of a term: Being right clearly more often than not. - Solid connection is something whose definition problem has not been solved in general yet; it is being under research. So we cannot meet 100% yet. Approaching 100% is the best we can hope for at the moment. Bass: The definition for solid connection is 100% accurate for all purposes where such a term is needed. Please stop attempting to fix it. RobertJasiek: All purposes includes beginners reading the "definition" while lacking proper experience and context knowledge. It needs urgent correction. All purposes also include non-SL usage of the term and there the "definition" is yet more improper. In particular, it is very wrong in the context of my terminology. You want to prevent informing well beginners, players interested in non-SL usage of the term and players interested in usage of my terminology. Bass: No, it does not need any "correction" at all. For the sake of exercise, I will now refute every single one of your arguments. A beginner lacking proper context can understand the term now. Proof by experiment: please show the current page to any person, go playing or not, and ask whether they can understand it. The definition does not need any correction. Evidence: not a single case has been presented, where by the current definition either a) something needing a term is misclassified as solid connection, or b) something that is a solid connection is not classified as such. Go terms in non-SL (or non-scientific) use constitute language. All natural languages are "improper" (which I take to mean "not rigidly defined in every way) by their nature. The purpose of a language is to convey ideas. This is easily achieved without rigid definitions. You probably should not mind your own terminology so much. Proof: the sentence "The closed opponent cannot virtual-force uncapturable life" does not mean anything outside a scientific paper where more than half of the words are explicitly defined. I do not want to prevent the learning of beginners. Proof: There is nothing that prevents the beginner from learning the correct meaning of the term now. I do not want to prevent anybody from learning the non-SL usage of the term. Proof: that usage is described very well in the current version of the page. I do not want to prevent the players interested in your terminology to get that information. However, your terminology is barely notable enough to warrant a footnote on the page, much less should it be allowed to ruin the perfectly clear and concise definition that is now available there. I think that should pretty much cover it. Different readers have interpreted the SL description of solid connection differently: some as all kinds of string connection, others as only such kinds of string connection that are good in some sense or justified by some sort of context. Since different readers can interpret the SL description differently in principle, this applies also to beginners in particular. So they do not know which meaning is correct or they are let believe that ambiguous meaning would be fine and so the decision making in their games remains also too ambiguous. The evidence cases are those of different readers interpreting the SL description differently. I agree that a purpose of language is to convey ideas. Furthermore I think that a purpose of a term is to convey a specific idea. Therefore the term description must be sufficiently clear to do it. Currently it does not convey a specific idea but a wide anbiguous range of ideas. Your example sentence citation "The closed opponent cannot virtual-force uncapturable life" is not a proof for why possibly I should not care my own terminology so much. "closed", the concept of "uncapturable" and "life" were invented and used by others before I started to use them, too. A scientific text needs to be, first of all, understood as such. Using terminology spefically for such a scientific text is done on purpose. The purpose is the contents' efficient presentation (efficient for scientists). Whether I care much about my terminology is a question arising later and outside that inventing document. If terms are useful also for other purposes, then I do care about my own terminology by using it again instead of inventing yet further terms with (almost) the same meanings. It has turned out that most terms can be used also elsewhere. In quite some cases, that was even a preliminary idea: concepts were roughly known before, then a research paper defines them carefully, then the concepts can be used with clear meaning from then on. Such is very useful in contexts where the concepts are useful. If somebody else invents more powerful or more practical terms, I will use them instead of mine. Until then I care about my terms because, for the purposes of their uses, they might be the most powerful. I believe you that you do not want to obstruct beginners. However, beginners are not likely to read long discussions like this but rather they read only the parent page. You make it difficult for them to learn by opposing clearer information there. It is not your intention, but it is the effect of your action. The current SL version does not describe the non-SL usage well because only the examples but not the so called definition section agree with the non-SL usage. Besides the parent page does not hint what is the non-SL usage. All uses of solid connection have equal rights of treatment - not some at prominent places and others in the footnotes. - What you call "the perfectly clear and concise definition" says, to give an example, the same thing thrice (that chains are being connected). This is the opposite of being concise. Tapir: Sentences like "Is a dead "Robert Jasiek" still a "Robert Jasiek"?" are not innocent, witty remarks and please don't even try to claim otherwise. As a co-discussant: @Bass: Why you don't provide your opinion on the cases (connect against peep or the 4-4 point low approach, tsukenobi, jump attachment) where there remains a difference, even if you discard all the imo misconstructed counter-examples? See my last attempt below. Bass: In case it is still unclear, I fully subscribe to the definition on the page itself, and see no gain in applying it to all possible cases separately. I also do not approve of the method; a sample among fewer than ten people is no basis for linguistic conclusions. @Robert: I try to clarify the practical difference between your term and the term as it was defined on SL, and I don't see my ramblings as yet another definition but an attempt to explicate the field of application. In your terminology, this might be similar to saying solid connection = thick cut protection, but I would never say it in those words by myself. RobertJasiek: If you do not want to use terms like thick cut protection yet, you can also use their list of criteria instead. - The major difference between SL's current description and my definition is that SL does not include the property "thick shape". Tapir: Wasn't thick string connection (as in connecting against a peep to a hanging connection) an unmentioned part of your term thick cut protection = this would not even be your term of solid connection (which is only a subgroup of the thick cut protection). Also, the number of new unfamiliar terms alone in the previous sentence makes me fear what will happen to terminology if your change were to be adopted wholesale by more people. I start accept the idea of classifying connections by the resulting shape and it's efficiency, regardless of personal preferences the page should offer both meanings, because obviously you use this term differently - but no position should be misrepresented. Although funnily people who agreed what is a solid connection before - just by limiting the use to relevant examples - might now wonder whether connecting dead stones is a solid connection or not. That is why implicit ways to deal which such issues are so powerful, the question people might puzzle about simply never arises. RobertJasiek: Not unmentioned. I have mentioned everything (even more than once). Thick string connection = thick + string connection = string connection creating thick shape. Easy, isn't it? Thick cut protection is explained in its link. That you need to search here for my definition of solid connection is not my fault; I have tried to list its alternative meaning where it belongs: at the parent page. So despite three new terms / meanings in one sentence, you need not fear. - The parent page should not offer both meanings but three meanings: there is also the common non-SL usage (although it lacks a clear definition so far). - Implicit ways are not powerful - except in delaying clarification of the relevant by many years. tartrate: I fail to see any benefits to the reader from Roberts proposed change to the definition. While I am quite happy to see an additional page about String Connection (Robert's own term) I don't think the current definition of Solid Connection needs any alteration. We could consider if some discussion could be added to the page indicating that sometimes solid connection could be bad, e.g. connecting two dead groups. I dislike proposed terms such as thick cut protection, because they are non intuitive in terms of english language. I think Robert is being provacative in trying, once again, to force through a change without first providing any cost benefit analysis. RobertJasiek: Why do you not see any benefit to the reader if the parent page adds thick shape as a charateristic to the definition section? It is a more relevant property of solid connection than the current description of "joins previously cuttable stones to each other so that there is no gap between them [...] the stones connected this way can never be separated from each other again", which is already clear from "[then] all the stones now belong to the same chain". Instead of saying the same thing thrice (that chains are being connected), the additional description of "thick shape" would add real information and avoid your suggested descriptions of "sometimes solid connection could be bad, e.g. connecting two dead groups". I do not think the purpose of the term is to allow very bad moves in the first place. By adding "thick shape", we avoid most bad moves and so do not need lengthy explanations that they are better avoided. tartrate: Robert, you should actually consider why people visit the page. If you did that you might gain a greater understanding as to the reason others object to your definition. RobertJasiek: Different people visit the parent page for different reasons. However, very likely there is an intersection of almost all readers: They want to be informed correctly. When there are four different uses but only one is shown, then that is desinforming the reader by tempting him to believe that there would be only one kind of use. A wiki is not like "I think your definition is too simple so let us remove it. You think that my definition is too precise so let us remove it." A wiki is there to inform about both. RobertJasiek: If everybody asked for cost benefit discussions before editing the wiki, then it would be a much worse place. E.g., there would still not be a page explaining thick shapes. Robert's term limits solid connection to connecting exactly two chains, which excludes connections against a peep to a hanging connection or the example from the string connection page. This limitation would allow to see the "solid" in "solid connection" as more than a specification of the way it is connected but as a property of the connected stone which form an efficient, thick shape as opposed to that the definition by Charles (as I understand it) allows to connect solidly but ending with empty triangles. Thinking about efficiency while connecting may be helpful to many players, so Robert may have a good case. What do you say? Or shorter as a question to all, who use the term in the SL/Charles Matthews meaning: RJ proposes to use "solid connection" only for those connection that produce an efficient shape. (His definition leads to the exclusion of e.g. all shapes involving empty triangles.) Do you think it is good to have such a term? Tartrate If the term for solid connection is augmented to exclude all manner of suicidal or nonesensical positions, the same will have to be done for hanging connection. Consistency of terminology is very important for a sucessful wiki. RobertJasiek: In fact, it should be done for every term. Often a simple "creates thick shape" or the like would already exclude most non-sensical moves. It is a prominent feature of thick shape moves that they do create thick shape. Bass: There is no need to exclude nonsensical moves. You can just say "nonsensical solid connection" if you really need to. Tapir: Not treating "solid connection" as an individual term may be a way out of the mess. The SL/Charles Matthews term is solid as opposed to tactical as opposed to strategical connection, this group of terms belong together and emphasise a certain aspect of connections (say, proximity). The RJ term family emphasises the thickness, efficiency of the resulting shapes and I wouldn't discard this undertaking lightly, even if I dislike the actual terms, the bulky definitions etc. Bill: Why do we have definitions? Mainly, so that we can talk to each other and we know what we mean. 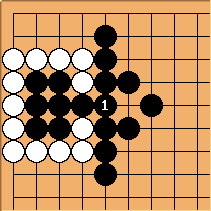 Now, some terms in go, such as light, refer to advanced concepts. They may therefore be difficult to define, and weaker players may make a lot of mistakes in usage. 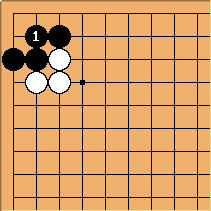 Some, such as kikashi, are difficult even for pros. As Sakata points out, pros may differ about whether a move is kikashi or not. But other terms, such as atari are easy to understand and define. Every player should be able to understand and use them correctly. IMO, solid connection, hanging connection, and keima connection are such terms. If we require go expertise to understand the definition, then we invite misuse and misunderstanding. To include efficiency in the definition of solid connection is madness, IMO. RobertJasiek: Efficiency is a mighty strategic concept. Therefore I agree that it is better avoided for terms like solid connection that can be defined differently. Nevertheless efficiency can be a tool for characterising or studying such a term or related shapes to better understand their nature. Definitions should depend on lower level terms whenever possible. On the other hand, aji is also a mighty and can be a complicated strategic concept but is useful for defining thick shape as having little or no aji. So "madness" is an exaggeration; let us better say "not the first desired means". Tapir: Just an observation: this page has the following aliases: Katatsugi, Pintsugi, SimpleConnection, SolidlyConnected, StrongConnection. And see also JF's comment, we have grouped together several japanese terms as solid connection, and you find neither explanation nor differentiation on this page. 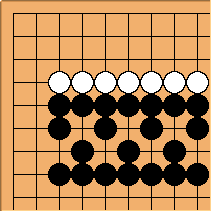 See: "As a go term, Solid Connection refers to a similar idea as the Japanese term katatsugi." but katatsugi is in fact an alias of the page. RobertJasiek: Now MoreSpecificDefinition makes a proposal that best fits a detailed definition study. The current parent page uses bad teaching because 1) its definition does not distinguish between bad and good moves and 2) it hides the existence of different meanings of solid connection. 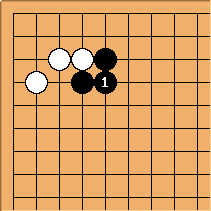 The proposal under the heading "Criteria 2" uses good teaching because 1) its definition distinguishes between bad and good moves and 2) it shows (for a player seeking improvement) the two most relevant meanings of solid connection.